I didn't miss anything and magma didn't trap sweet f-ck all. 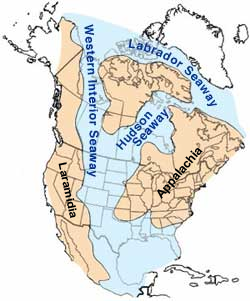 Nor Am was split into three land masses by shallow seas (origins of W Canadian oil, gas and potash) and left a stratigraphical column of layers comprised of limestone and shale followed by swamp that piled up millions of years of biomass that was compressed into coal after being covered by more layers of sedimentary rock. Last edited by petros; Dec 31st, 2018 at 01:38 AM..
You did, even when the same question was asked again you just ignore it. For claiming to belong to the most informed collective that has ever walked the face of the earth you are very wrong in all your conclusions and your are the rudest fukers I have ever encountered. That is a common trait with liars of all stripes. Overblown egos are fair game if I am going to get insulted for having an opinion, yet alone an informed one. You and Dex should start a thread to show me how 2 civilized gentlemen discuss theoretical subjects. Let's stick with Alberta for the coal part as that was a shallow sea, which is what a swamp is, and the water from the GOM to Hudson Bay was about 2,000 ft deep. Why would the plant material that fell to the bottom of the swamp and the die not completely rot as it lay in the same places where limestone was created. It certainly does that in any lake around today, when it dies above the water it becomes black dirt and then into clay as it ages. You version has plant matter dying but nit rotting for a few million years and then a few more years for rock to cover it when you do not explain even where the rock material came from. Between the 2 coasts we have today or on a global scale?? When you have two mountain ranges near both coasts and lowland in between the zones have been established. Are you saying the age of the sea-floor map is bogus?? I'm always reality based, that doesn't mesh well with a collective that runs on lies and misinformation does it?? 'Your kind' pushes the same diameter, today the ocean level would have to be raised 2,000ft to get water to where it is on your map. Where is the water today? 500M sq km today is 75% of the surface of the globe and 2,000ft rise would take about 50% more of the land. The trees and animals on both coasts are different, the west is the same as China and the east is the same as Europe on an expanding earth model. Your version has 1/2 of Pangaea being underwater and no explanation for 2,000ft being accumulated just on the land and zero on the rest of the sea-floor. The coal in the east is above your water-line so revamp your theory and come back when it is something other than fiction, . . .
Our coal is above the waterline!!!!!!!!!!!!!!!!!!!!!!!!!!!!!!!!!!!!! Congratulations LIE-beral LIARS for having used massive piles of B.S. to BLOCK the view of honest issues!!!!!!!!!!!!!!!!!!!!!!!!!!!!!!!!!!!!!! Like the fact that the LIE-beral carbon crap and trade tax is nothing but a MAJOR GRAVY GRAB so LIE-berals can BUY the votes of civil service union Hogs and illegals, and Black Lives Matter bigots, and drunken natives of Idle No More!!!!!!!!!!!!! Congrautlations for temporarily having steered your side of the debate AWAY from the TOTAL FAILURE of the Paris Accord AND the carbon crap and trade scam to do anything but pull cash out of wallets and leave the dirt in the air!!!!!!!!!!!!!!!!!!!!!!!!!!!!!! Congratulations LIE-berals on being TOTAL FAILURES on multiple fronts as your delusional and wildly selfish world views come crashing down in RUBBLE!!!!!!!!!!!!!!!!!!!!!!!!!! The climate goals Our idiot Boy Justin and his loser LIE-berals are seeking are ENTIRELY OUT OF REACH!!!!!!!!!!!!!!!!!!!!!!!!!!!!! Unless of course LIE-berals chose to do to ALL OF CANADA exactly what they are doing to the Alberta economy!!!!!!!!!!!!!!!!!!!!!!!!!!!! LIE-beral policy- if taken to its logical conclusions will DESTROY our economy!!!!!!!!!!!!!!!!!!!!!!!!! Canada’s approach to “fighting” climate change is based on magical thinking. Consider: Prime Minister Justin Trudeau has announced to much fanfare that he is going to ratify the Paris climate treaty. In doing so, he has pledged to lower our industrial greenhouse gas emissions linked to climate change to the same levels as former prime minister Stephen Harper promised, back when the Liberals called Harper a climate denier. Trudeau is never going to achieve Harper’s targets -- 17% below 2005 levels by 2020, 30% below by 2030 -- because our current level of technology makes it impossible to do so without causing a massive recession. Harper was never going to achieve Harper’s targets. In fact, no Canadian prime minister going back to Brian Mulroney, through Jean Chretien, Paul Martin, Harper and, as we shall soon see, Trudeau, has ever come close to meeting his promised emission cuts, which keep getting watered down even though they’re still impossible to meet today. But even if every nation on Earth, including Canada, fulfilled its emission cuts submitted to the UN -- also impossible -- all the Paris treaty would do, according to climate scientists, is lock the world into dangerous global warming, far above the 1.5C to 2C threshold they say is the upper limit. If Canada, or any country, fails to achieve its emission targets under the Paris treaty, nothing happens. The treaty has no mandatory deadlines or penalties for failing to reach these targets. All the Paris treaty requires is that countries report their targets and progress made towards achieving them, but there is no penalty if they don’t. Trudeau and Climate Change Minister Catherine McKenna say they are going to establish a national carbon price following negotiations with the provinces. But even if they succeed in bringing in a national carbon price of, say, $30 a tonne, the level of B.C.’s carbon tax and the highest in the country at present, emissions will be virtually untouched. The B.C. government itself says its revenue neutral carbon tax, widely praised as one of the best in the world, is only going to reduce B.C.’s emissions by three megatonnes (Mt) annually by 2020. By contrast, if Trudeau is to make good on Harper’s target for 2020, which is now his target, Canada will have to reduce its emissions by 146 Mt. That’s the equivalent of shutting down Canada’s electricity sector, which emits 78.2 Mt of GHG annually, along with most of the agriculture sector, which emits 72.9 Mt of GHG annually, in less than five years. Canada would need a carbon tax of at least $150-per-tonne to achieve these kinds of emission cuts that quickly, which would destroy our economy. The only way to achieve cuts at the level and speed the Trudeau government is promising would be through a revenue neutral scheme called carbon fee and dividend, in which every dollar the government imposes in carbon taxes is returned to the public through equal, monthly, dividend cheques. But our politicians aren’t going to do that because it wouldn’t increase government revenues, which is their real aim, as opposed to reducing emissions. What Trudeau’s carbon pricing scheme will actually become is a permanent sin tax imposed on Canadians, punishing them for the sin of using fossil fuel energy, which will swell government revenues by billions of dollars annually but do nothing to reduce emissions. That’s what happened in Europe and it’s exactly what’s going to happen here. [/QUOTE]Do you have a library card? The only cards I have are you fukers from the asinine collective. Not only clueless in this subject but you don't even know their history. So you have absolutely no interest in learning just babbling incoherently? His tin foil hat is failing to protect him from truth and logic and he is BECOMING ANNOYED!!!!!!!!!!!!!!!!!!!!!!!!!!!!!!!!!!!!!!!!!!! ! And when Muslims get annoyed- things go BOOM!!!!!!!!!!!!!!!!!!!!!!!!!!!!!!!!!!!!!! In this cae we can hope it will be MHz`s head that explodes rather than some C4 plastique explosives!!!!!!!!!!!!!!!!!!!!!!!!!!!!!!!!!!! Dex teach you to act like a jackass or did you have a worse teacher?? You would be surprised at how much time I don't spend in the bathroom crying per day. When I tell somebody to fuk-off I quit posting to them. Pete will last as long as you or DipShit. I wonder what I could to fuk you all up at once, . . . ??? I'm following your lead. Don't like it? Now the troll part is taken care of you can do a point by point reply like I do. You could wait for the diamond thread as that will let you do it right. His brains are boiling with rage!!!!!!!!!!!!!!!!!!!!!!!!!!!!!!!!!!!!!!!!! And he is so deranged that he thinks talking about ancient sea floor maps will help him get his anti Jew Hysteria accepted!!!!!!!!!!!!!!!!! And why does Cdn post office hate Jews as well??????????????? I will give this to Michael Mostyn and his crew at the B’nai Brith: They have mastered the art of the smear. They understand very well that whoever throws the mud first generally wins, no matter what the merits of the argument. B’nai Brith’s latest smear campaign is against the Canadian Union of Postal Workers (CUPW). The obvious aim of this campaign is to punish and discredit CUPW for having taken a principled stand in defence of Palestinian human rights. “With regard to the specific allegations made, Ahmad Naser Jarrar, whose picture was posted by a member on our Facebook page, was never brought to a court of law and found guilty for the crime he had allegedly committed. He was shot dead together with two other Palestinian civilians by Israeli soldiers during a military search operation in the town of Jenin and its refugee camp and villages in the occupied Palestinian territory. Nadia Shoufani, teacher, falsely claiming she was a supporter of terrorism. Now, B’nai Brith is working hand in glove with pro-apartheid politicians like James Pasternak and Doug Ford to try and shut down the annual al-Quds rally. In a recent video, Michael Mostyn called our gathering a “hate rally.” In one sense, Mostyn is correct: we in the Palestinian solidarity movement, which includes brothers and sisters from the Jewish community, hate injustice, oppression, hypocrisy and lies. We also love peace and equality. If and when B’nai Brith stops smearing those who defend human rights, Mostyn will have no more ‘hate rallies’ to contend with. with all your ignorance and insisting stubbornly .. I think almost your origin is a communist from iraq or egypt .. From iraq most probably, because you adopt the name of gilgamesh .. I noticed many communists here admire gilgamesh the myth, but they disbelieve about noah the prophet of god. And like the communists and atheists here, you are clever at cursing and reviling .. Nothing else. Every time I see cliffy's name on a post I expect a Fakebook meme and he never disappoints me.....ROTFLMFAO! Every time I see DipShit's name on a post I expect a 'troll-like post' and he never disappoints me.....ROTFLMFAO! Just popped into my head out of the blue, . . . now where was I. ah yes, . . .
As you point out so often, we are different levels. where did you steal that meme doood? f*ck, you are worse then avro FFS. The plates in your head ARE NOT to be disturbed!!!!!!!!!!!!!!!!!!!!!!!!!!!!!!!!!! The Prime Minister finally found time after his vacation to visit Toronto on the Danforth and place a bouquet of flowers at the makeshift memorial for 18-year-old Reese Fallon and 10-year-old Julianna Kozis, who died in the mass shooting July 22 by Faisal Hussain. For some reason Justin Trudeau could not condemn the actions of the Pakistani-Canadian who spread terror in our city. Instead the P.M. called for “a time of compassion” among all of us. Compassion? For whom? For the dead? The dead don’t need compassion; they need justice and the truth. So was Trudeau calling for “compassion” towards mass murderer Faisal Hussain? Is it possible he was influenced by the spin doctoring of those promoting the theory the killer’s actions were exclusively the result of mental illness? If so, he is not alone. Days after the shooting, I took a long stroll down the Danforth to get a feel for the tragedy that unfolded so close to home. What shocked me was the absence of any large portraits of Reese and Julianna killed by Hussain. What outraged me more was the obvious empathy for the killer as a ‘victim’ of neglect by the ‘system’. The spin doctors had been very successful in blindfolding the community into believing that had the system treated Hussain’s supposed ‘mental illness’, the tragedy would never have occurred. More than one message at the makeshift memorials had people praying for the ‘soul of the shooter’. Then on Sunday, a solitary protester who blamed CBC for covering up possible Islamic influences in the attack was confronted by a woman, dressed up as a niqabi wrapped in red. She started provoking the protestor by standing in front of him and as the video of the incident showed, deliberately pushed her back into his sign. The jostling, mainly by the niqabi woman continued until she had help from her sympathizers. A man entered the fray and just threw the protester inside the Alexander Park fountain drawing loud cheers and laughter. The police arrived, but instead of laying assault charges on the attacker, dragged the victim away. To the bleeding-heart, guilt-ridden white liberals and leftists who attacked a single protester, I would like to invite you to please pay attention to extracts of this sermon at the mosque on Thorncliffe Park that catered to the Muslim youth where Faisal Hussain lived. Oh Allah, Defeat them and make the ground shake beneath their feet, and show us in them the wonders of Your Might, for they are weak before You, O Mighty, O Powerful. O Allah! Raise the standing of Islam and the Muslims. The Mullah’s sermon ended with the usual rhetoric about Muslims suffering around the world being a result of the conspiracy of non-Muslims. “The text, when understood in the right context and mainstream interpretation, clearly addresses tyrants and oppressors in general. Any suggestion that the language refers to non-Muslims or that the statement encourages Muslims towards violence are categorically false and inaccurate,” the board said. We don’t know whether Hussain was exposed to these prayers. We do know apologists justify prayers like these by suggesting they should not be taken literally, which is outrageous. There are thousands of prayers or supplications that could be used that don’t employ language that surely qualifies as hate speech, especially to susceptible minds. There needs to be among Muslims in this country a rejection of these hateful supplications.